In this week’s newsletter, I will illustrate the power of using triple timeframe volume analysis, along with the Hawkeye Adds algorithm to show how we can significantly boost our trading profits. On the chart above, I am displaying the 20 minute bars of the front month of Crude. Under the price bars, I have three plots. 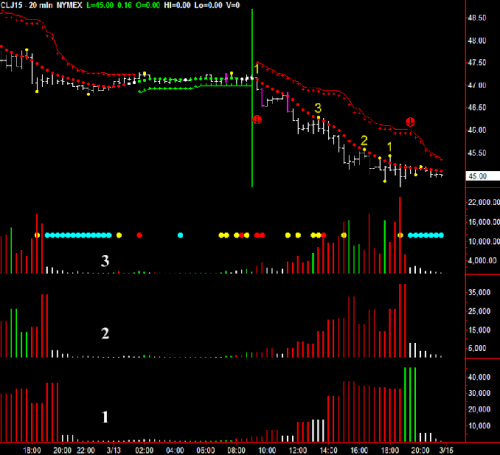 On Plot 1, I’m displaying the volume from the 60 minute chart. Plot 2 shows the 40 minute volume, and Plot 3 shows the 20 minute volume. The green vertical line is the open of the London session at 9:00 am GMT, and the red arrow shows you exactly when the trend changes. Now, let’s look at what the volume plots are telling us about that point in time. Notice how Plots 1, 2, and 3, all have red volume. Also, on Plot 3, you can also see there is a red dot right, followed by another red dot showing ultra-high volume. So, that is your point of entry. Now, as the downtrend continues, notice the numbers 3, 2, and 1 that appear above the price bars. What this means is that the Hawkeye Adds algorithm has calculated the optimal levels for adding further contracts to the position (an extra 3, 2, and 1). So, along the way, your position would grow from 1 contract, to 4 contracts, to 6 contracts, and finally 7 contracts to boost the overall profits of the trade. The second red arrow shows you where you should exit the trade. On Plot 1, you can see that green buying volume has come into the upside. While on Plots 2 and 3, it is neutral, no-demand volume. The other thing to notice is how the trend dots are flattening out at that point and how we even have a close above a trend dot, showing us that the momentum of this down move is finished. So, that would’ve been the best place to exit this trade. So, what kind of profits are we talking about here? If you would’ve traded just one contract, from the top to the bottom, you would’ve made a healthy 1.70 points. However, by using the Hawkeye Adds profit accelerator, you could have made 4.20 points out of this move. 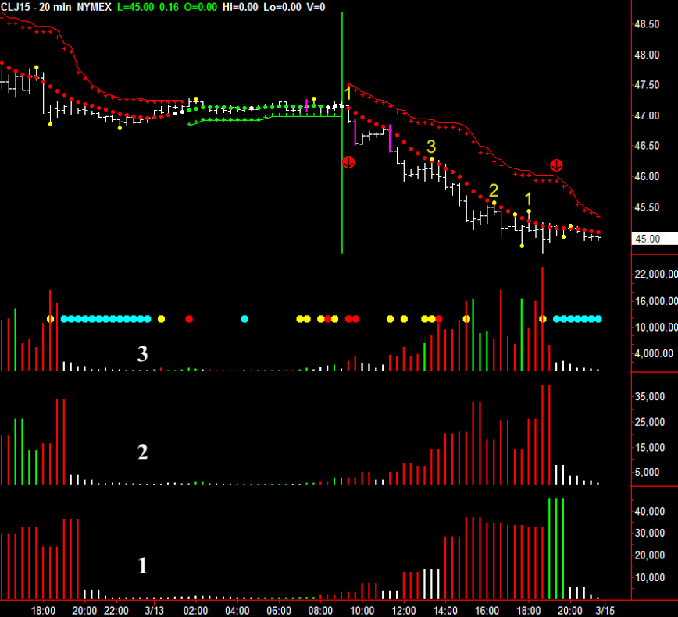 That boosted the overall profits of this move by about 2.5x! So, a SUBSTANTIAL increase of profits, simply by using the Hawkeye Adds profit accelerator. If you would like to learn more about the Hawkeye Adds algorithm, CLICK HERE. Lastly, if you haven’t picked up a copy of the Hawkeye Volume Starter Package yet, please CLICK HERE, and get started using Volume to start increasing your profits today! Previous PostPrevious Don’t Be Sucker-Punched When Trading The YM – Wait For Confirmation!